4.0 MILES—6 BREWERIES-–WITH A BEER AT EACH! Choose from Slippery Pig Brewery, Sound Brewery, Valholl Brewing, Rainy Daze Brewing, Envy Bar & Grill (featuring Silver City Brewery) or Western Red Brewery to start and end your run at. 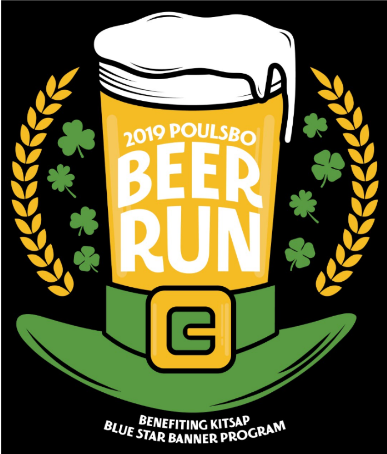 SLUYS POULSBO BAKERY will also be giving a FREE Doughnut or cookie for each runner during the run..... what can be better then an awesome Doughnut during your BEER RUN???" Cost: $42 for early registration or $45 after January 31st. Price includes race entry, 7 beers, and a finisher’s prize. The cost of this event will increase by $5 on Feb 1st so register early! Sign up before February 8th and you can have your race bib customized with a name or saying of your choice, for no extra charge. The race is limited to the first 750 runners registered (125 Runners at each Brewery). This run always fills up fast! Race Packet Pickup: To avoid long lines the morning of the race, we recommend packet pickup on March 7th and 8th at Slippery Pig Brewery from 4:00-7:00PM. But you can always get your race packet the morning of the run at your starting location. Check-in starts at 8AM, Run starts at 8:45AM. THIS IS A ST. PADDY’S THEMED RUN SO BE SURE TO DRESS IN YOUR BEST IRISH BEER DRINKING COSTUME! Comments will appear on your friends' news feed.